I have been physically unable to cook since my accident. Cooking really is a nice stress reliever for me — and the past six weeks have been quite stressful. I needed to cook. Why couldn’t I cook, you may ask? My right arm has had some severe mobility and strength issues. I am recovering quite well though. I knew I wanted to try to cook a meal on Sunday, but what would I make. Flipping through the channels on Sunday morning I stumbled upon the Spring Lunch episode of Giada at Home. 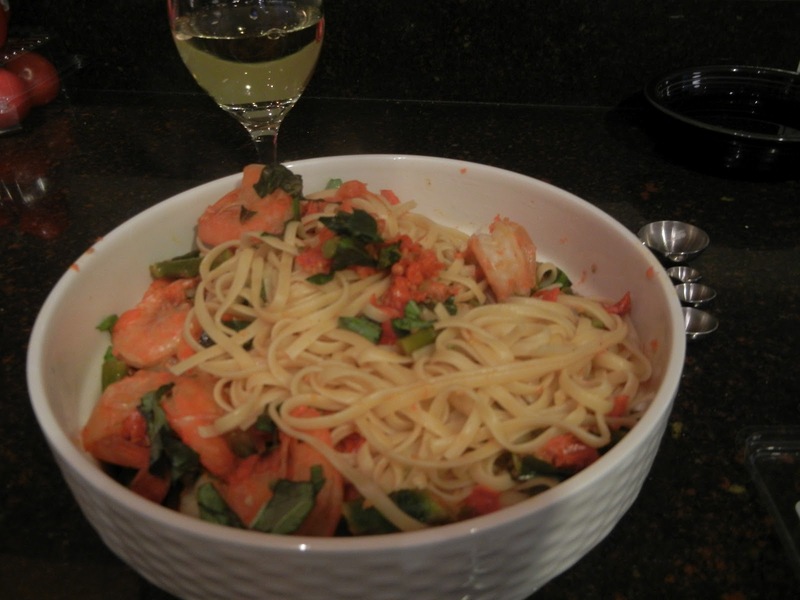 The entree was a Linguine with Shrimp, Asparagus and Cherry Tomatoes. This sounded great – it wouldn’t require me to use both hands while eating and I really love shrimp, asparagus and of course tomatoes. I made my shopping list and hit the store — twice. I forgot to put asparagus on my list. Ugh. I also got the wrong shrimp – I didn’t get peeled shrimp, but easy peel instead. More on that later. This recipe was super easy to make. It didn’t take a lot of chopping or other prep work. It was quite a quick meal too. My tomatoes really liquefied before the everything else was done – and since I love tomatoes so much, it was a bit disappointing. Perhaps the heat was too high or I let it cook too long. If I thought about it at the time I would have reserved 25% of the tomatoes and pop in the pot about 5 minutes before serving. I mentioned earlier that I purchased the wrong type of shrimp. The unpeeled shrimp added a huge amount of flavor — way more than I expected. I didn’t even realize they were unpeeled until I dumped the sauce on the pasta. The sauce it self was quite runny, but within a few minutes the pasta had absorbed this very flavorful liquid. The worst part was peeling the scalding hot shrimp with a gimpy hand. Would I make this meal again? Probably not. It was quite tasty and easy, but it just didn’t sing to me. I must say, using the unpeeled shrimp really kicked the flavor up a bit. New Series – Favorite Things. To help me focus some of my writings I have a couple series that I work on from time to time. “Where I’m Staying” and “What I’m Cooking” is being joined by “My Favorite Things”. I was never a big fan of Oprah, but I did like her “Favorite Things” episode. I didn’t like all of her favorite things, but I usually found a little something that I wanted or just had to have. Now that Oprah is gone we are now stuck finding our own favorite things. Even Barney Stinson from How I Met Your Mother got into the Favorite Things Game. One of my favorite things is the combination of dark chocolate and sea salt. I could eat the Intense Dark Sea Salt Soiree for every meal for the rest of my life and be a very happy man. A few weeks ago, MS arrived at my house with all the fixin’s for dinner (he has cooked almost every Sunday since my accident, how great, eh?). He has to have dessert — not “likes to have dessert”, but “HAS to have dessert”. He saw something new in the ice cream case and knew I’d enjoy it. 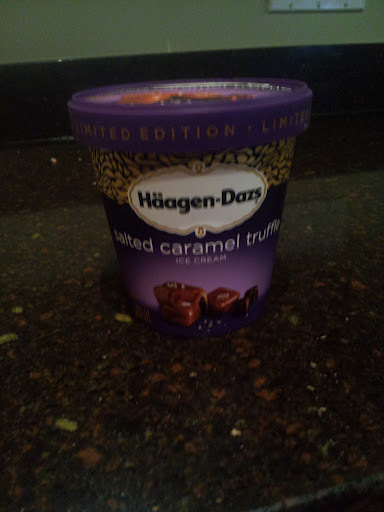 Enter Haagen-Dazs Limited Edition Ice Cream – Salted Caramel Truffle. This is a simple vanilla ice cream with ribbons of salted caramel with little chocolate truffles. I usually don’t like chunks of stuff in my ice cream, but this stuff is absolutely amazing. I have actually turned into a dessert guy now — I really love finishing off a meal with this very rich treat. My two biggest concerns? One: I will eat so much of this I will get fat and the sugar will rot my teeth. Two: This limited edition of this ice cream won’t be around when I go to the store next. According to the website this stuff is around until December. That means we have only 9 months of this wonderful little bucket of heaven is gone forever. Have you all tried this yet? What about the other Limited Edition Haagen-Dazs flavors? Which ones should I try? We need to tell the good people at HG to make this a permanent resident of our grocers freezer. When you think of food and Memphis I would be surprised if you didn’t think of BBQ. I didn’t do much planning before this business trip so I didn’t have a list of restaurants to try. 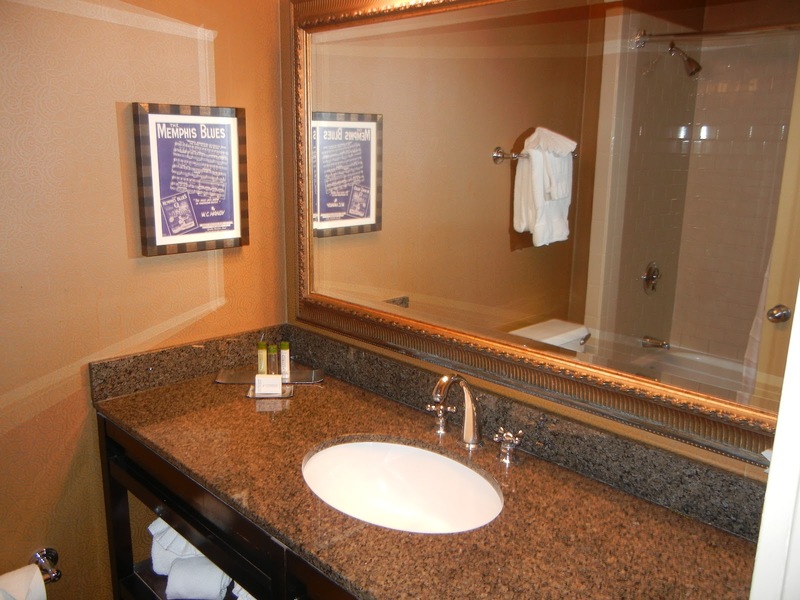 When making reservations at the DoubleTree Downtown Memphis, I noted on my reservation that I would love a list of recommended BBQ restaurants available upon arrival — which they surprisingly provided. One of the restaurants was closed, but the second choice, which came highly recommended was The Pig. The Pig is on Beale Street, just a 3 minute walk from the DoubleTree. It was about 19h00 and raining. Beale Street was pretty empty. I was dining alone. The sign at The Pig said I should wait to be seated…so I waited and waited and waited and waited. I noticed one of the bartenders waving me in — they seemed to be quite annoyed that I was waiting for service (as the sign required). I choose a seat and waited for a server. A young woman who looked about 17 months pregnant came up and asked what I wanted to drink. I followed up with “What beer is on tap”. She was unhappy I asked her this and she walked away. Almost immediately a replacement server came up and list the limited number of beers on tap. I went wild and had a Blue Moon. 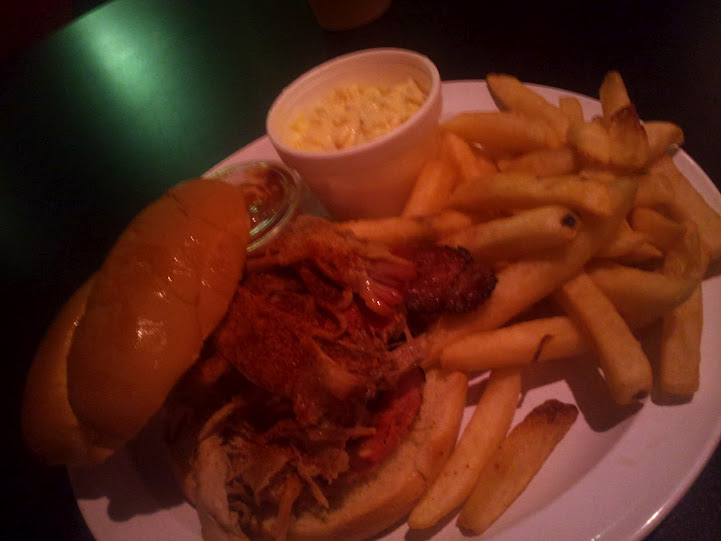 After spending a few minutes looking at the menu I decided to order the Jumbo BBQ Pork Sandwich with Fries and Slaw. The sandwich was delivered very quickly. The meat was flavorful but the bun was cold and stale – not even toasted. I ate this quite quickly despite it being of average quality. After dinner the preggo server asked if I wanted dessert, of which they had two selections: Peanut Butter Pie and Pecan Pie. I asked the server if the desserts were homemade. She appeared to be confused and then insulted by this. I explained the question again and said that I wasn’t really excited about eating a mass marketed dessert, but if it was homemade I would give it a try. The server then understood and said the desserts are made fresh every morning. I ordered the Peanut Butter Pie…it was also average. I thought the whole experience was quite average. The food was extremely reasonably priced. When I’m in Memphis again, will I return to The Pig? Probably not. It was perfectly fine, but I am sure I can find a better BBQ Joint in Memphis. Where do you recommend I go next time I am in Memphis? Is Beale Street too touristy to get good food? Other than BBQ what should I get while in Memphis? I had my first business trip following my accident two weeks ago. I went to Memphis for a mediation. The work trip itself was successful and I got to see a tiny bit of what appears to be a great small City. I took an expensive United flight (nearly $1,100 to fly less than 500 miles, that’s crazy!) landing at 17h30. Being a Delta hub, I was surprised to see only one other plane at the airport (not counting FedEx, of course). 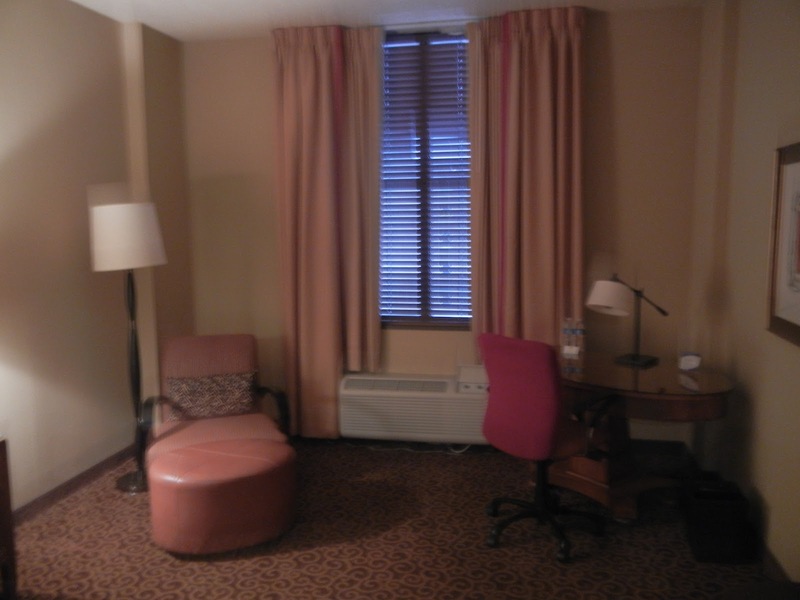 I was in a taxi less than 10 minutes from touchdown and was in the lobby of the DoubleTree Downtown Memphis by 18h00. I had left a note when I made my reservation saying this was my first trip to Memphis and that I am interested in recommendations for BBQ joints. When I arrived at the check-in desk I was greeted by Lenee. She pulled my reservation, thanked me profusely for being a Gold Member, gave me a welcome cookie, tickets to the lobby happy hour and immediately started telling me about her favorite BBQ joints within walking distance. She and her colleague along with one of the valets began telling me the good and bad of these places. I then explained to Lenee that I was nursing a severely broken arm and I would need more pillows for my bed. She said I already had 6 on my bed but if I needed more just ask. I headed up to my room and was surprised by its size. There weren’t enough pillows for my cocoon that I need to sleep now (damn aching/healing arm). The room was large and relatively clean, but it looked like it hadn’t been refreshed in quite a while. It was just a bit old and tired. It was quite comfortable and suited my needs for one night. I did have two complaints (which I did not raise to management). 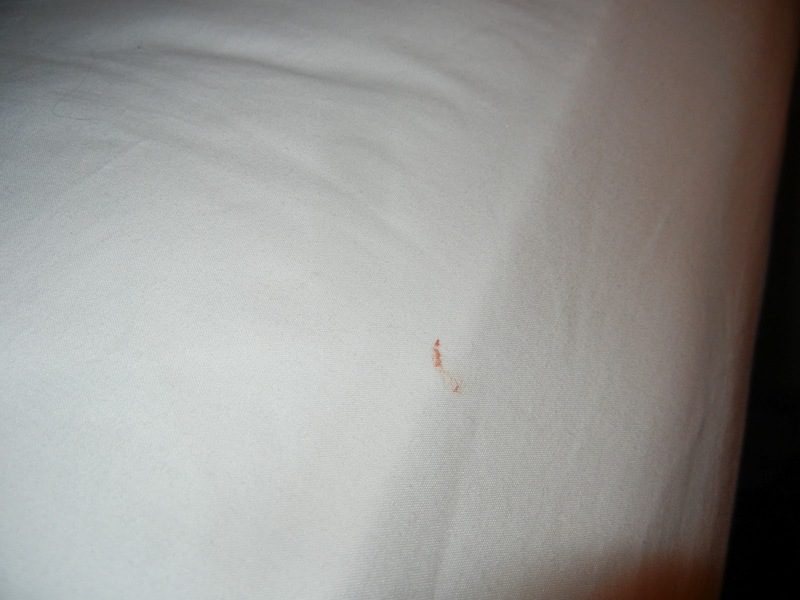 The first, it appears the sheets on my bed were stained with something red (blood, ketchup, BBQ sauce, lipstick???) – the sheets had been washed but were just old and stained. I decided to cover the stained area with a towel and sleep on the other side of the bed. 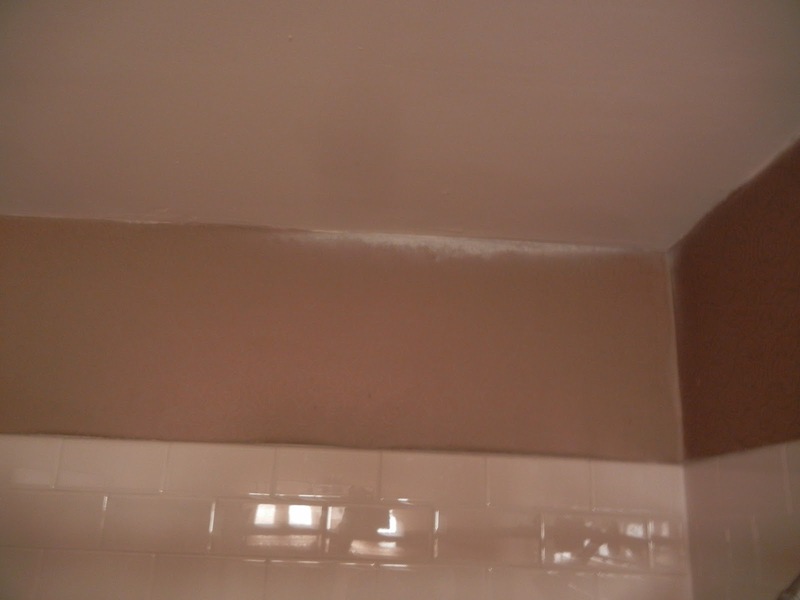 My second issue – the shower. The tub itself was so slippery I nearly fell. This of course really scared me since I’ve been very skittish since my accident. The hotel should either change their cleaning supplies or provide one of those gross anti-slip mats. 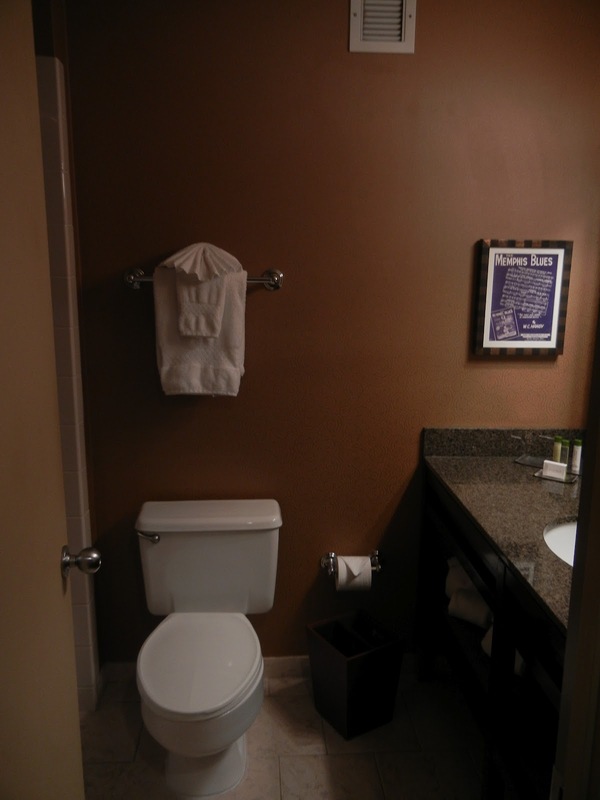 The staff at this hotel really did provide top notch service – as good as I received at the Four Seasons or the Ritz Carlton. The housekeepers on the floor called me by name both in the evening and in the morning. The location of this hotel was really great. It is immediately across the street from the Autozone Park and just a two minute walk to Beale Street (queue Walking in Memphis by Cher). I didn’t really get to explore the City since I was only in town for 24.5 hours and was working most of this time. I did get BBQ – I’ll review the BBQ Place in my next entry. 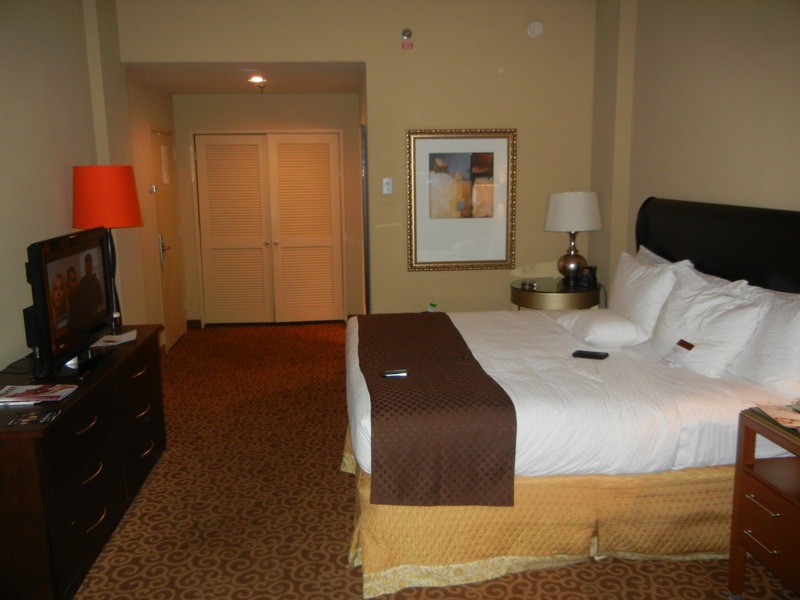 Would I stay at this hotel again? I’d say yes. Was it perfect? No, but it was more than adequate with truly top notch service. Kudos to Lenee and her colleagues. Thank you for truly making my stay enjoyable.